The ipro2 Professional Continuous Glucose Monitoring (PCGM) technology helps clinicians gain more complete insights into their patients’ blood glucose profiles. When used to make therapy and lifestyle recommendations, Professional CGM data can lead to improved glucose control. The sensor is placed by the clinician in the office. The patient is taught how to document blood glucose reading, food, exercise medication and other events. The iPro™2 is convenient to wear, discreet and watertight. No alarms to manage. Patients wear the device for 3-6 days and afterwards return to the office for download. The clinician analyses the data and provides a customized patient plan. iPro™2 is a Professional Continuous Glucose Monitoring (PCGM) device designed to provide a more complete picture of a patients’ glucose levels, by collecting blinded glucose data in an easy way. It enhances the ability to make confident treatment decisions that can lead to better diabetes management. 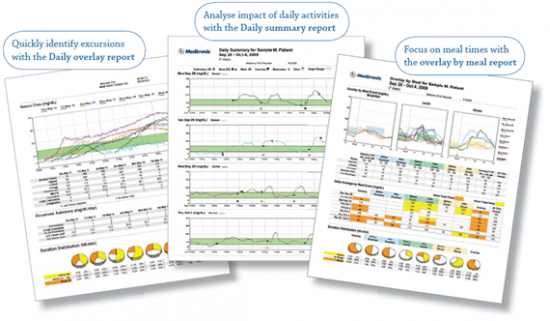 The comprehensive report from the iPro™2 is easy to read and offers a wealth of information. As a health care professionals I am always searching for tools to evaluate a patients’ glucose control in a quick and easy way to optimize diabetes management. The iPro™2 allows just that. iPro™2 system current uses the enlite sensor. It is quick, easy and virtually pain free to insert. Please note that the enlite sensor for the iPro™2 system will be inserted by a healthcare professional, not by yourself. Watch the video below.